With one simple flourish, the Camden Wrought Iron Corbel offers the ideal decorative accent that's also practical and functional as support for the breakfast bar, mantel or shelving. This two-inch wide bracket is offered in four sizes and seven finishes to work well in a variety of applications. 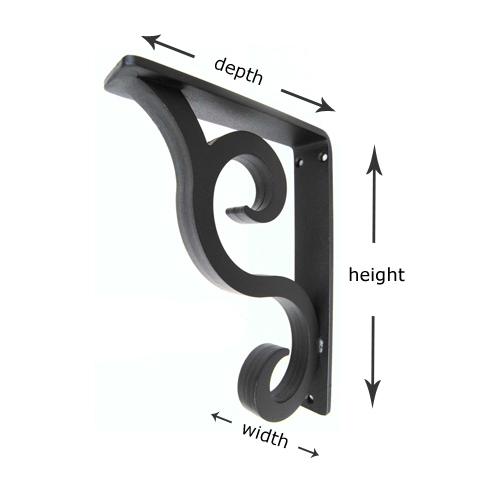 Note: This corbel has a 1/4" thick L Bracket and pre-drilled holes for mounting. If you need top mounting holes for shelving, please choose that as an option from the drop down above. 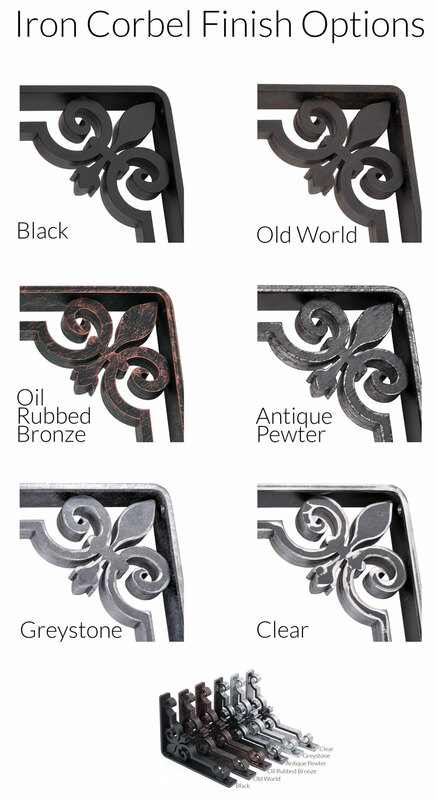 Mounting Hardware: Not Included - Mounting holes are predrilled into the back; if you want mounting holes predrilled on the top of your wrought iron bracket please select that option from the drop down menu. Use: Granite/Natural stone counter top overhang supports, shelf brackets, bar brackets, mantel support. Average customer Reviews: 5 of 5 Total Reviews: 3 Write a review. These corbels were perfect for my project. I am glad I spent the money on the option for the screw holes on top. It made attaching the Walnut slab much easier. Your product is just what we needed, heavy duty, good looks and great quality!